How many times a day do each of us lie? A growing body of research shows that people lie constantly, that deception is pervasive in everyday life. 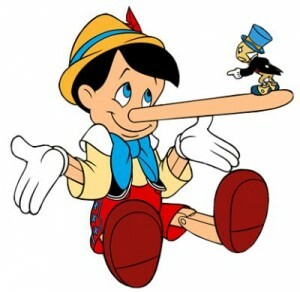 One study found that people tell two to three lies every 10 minutes, and even conservative estimates indicate that we lie at least once a day. Some of these are ‘white lies.’ You may tell someone their outfit is great when you think it’s horrible. You may tell your boss his/her development plan is super, when you hate it. You may say you won’t be at home when you’re supposed to help with a civic event you’re not in to. There are many, many white lies. Lying seems to be a growing problem in today’s world, and it has pervaded the lives of our children by lying about them for personal means. For example, recently a Fulton County Georgia Grand Jury indicted thirty five educators from the district, including principals, teachers and testing coordinators in a cheating scandal . They faced charges including racketeering, theft by taking and making false statements about their roles in an alleged plot to falsify students’ standardized tests. In other words, they lied about the true scores of students attending public schools in Fulton County, to puff up school accreditations. And some of them were paid to do it. “The philosopher Immanuel Kant said that lying was always morally wrong. He argued that all persons are born with an “intrinsic worth” that he called human dignity. This dignity derives from the fact that humans are uniquely rational agents, capable of freely making their own decisions, setting their own goals, and guiding their conduct by reason. To be human, said Kant, is to have the rational power of free choice; to be ethical, he continued, is to respect that power in oneself and others. Lies are morally wrong, then, for two reasons. First, lying corrupts the most important quality of our being human: our individual ability to make free, rational choices. Each lie we tell contradicts the part of a person that gives he/she moral worth. What do you think about lying? Has another’s lie hurt you?